Electrical Engineering - What is Armature Reaction? When a machine operates at no-load, there exists in it only the m.m.f. of the main poles which creates the main flux Φm Fig. (a). Under load when, when a current flows through the armature winding, an m.m.f. appears (which creates Φa) that interacts with the main m.m.f. Fig. (b). 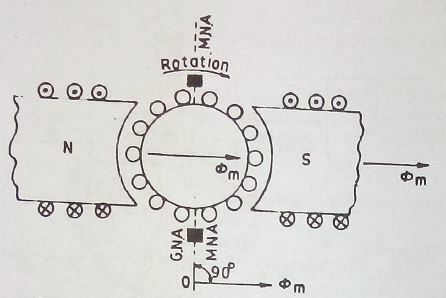 Hence the magnetic flux Φr that exists in a machine when it operates under load should be considered as the resultant flux created by the resultant m.m.f. Fig. (c). "The action of the armature m.m.f on the main m.m.f is termed as armature reaction". Fig. (a). Flux produced by main field of a generator. (i) Cross-magnetising or distorting component. 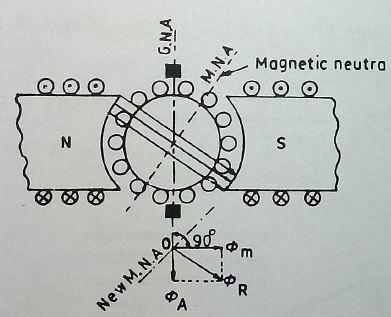 This component is at right angles main field, because this to the component crosses the main field flux, it is known as the cross-magnetising component of the armature flux. Fig. 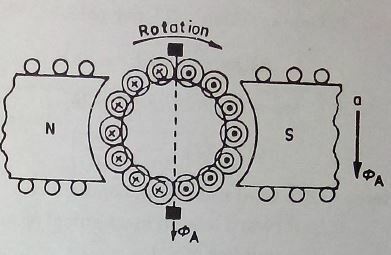 (c) Shift of generator flux due to armature flux. (ii) Demagnetising component. This component is in the same plane as the,main-field flux.The direction of this component is opposite to the direction of th,e main field flux, with the result it tends to reduce the effect of the maintained flux.